Effective Resolution 1920 x 1080 Shooting Resolutions Lossless CinemaDNG RAW and Apple ProRes 422 (HQ) at 1920 x 1080 Focus Focus button turns on peaking. Storage Type Removable SDXC, SDHC cards. Storage Format SD card can be formatted in either exFAT or HFS+ Lens Mount Active MFT Screen Dimensions 3.5" and 800 x 480 resolution. Screen Type Integrated LCD. Storage Rates 220 Mbps using Apple ProRes 422 (HQ) Compressed Recording Formats Apple ProRes 422 (HQ) in QuickTime MOV, lossless CinemaDNG RAW. Recording in 1920 x 1080 with choice of Film or Video Dynamic Range. Analog Audio Output 1 x 3.5mm stereo jack headphone output. HDMI Audio Output 2 channels 48 kHz and 24 bit Connections HDMI Video Output 1 x Micro HDMI Type D output. Analog Audio Input 1 x 3.5mm stereo audio. Analog Audio Output 1 x 3.5mm stereo jack headphone output. HDMI Audio Output 2 channels 48 kHz and 24 bit. Computer Interface USB 2.0 mini B port for software updates and configuration. The Blackmagic Pocket Cinema Camcorder was added to the Camcorders category in June 2016. 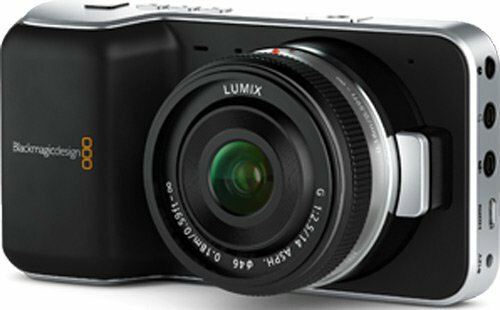 The lowest price GetPrice has found for the Blackmagic Pocket Cinema Camcorder in Australia is $1,289.00 from Digital Camera Warehouse. Other merchants who stock it are Digital Camera Warehouse, Camera House.